Hotel Le Germain Quebec is Le Germain’s first property, located in two buildings side by side in the heart of old Quebec City close to the old port and the city’s former financial district. 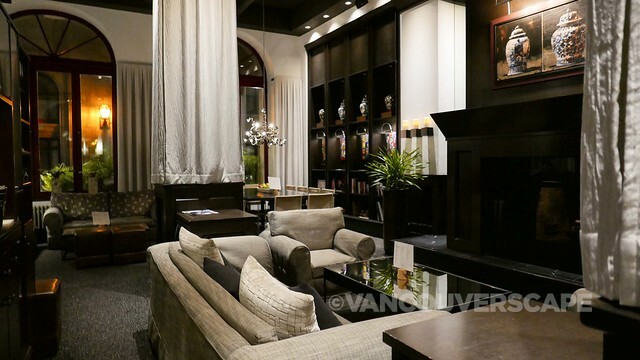 One portion of the 60-room hotel is housed in a former bank while the other served as headquarters for Dominion Fish and Fruit company (started by vegetable merchant Patrick Hogan, fishmonger Israel Montreuil and produce seller Joseph Simard). 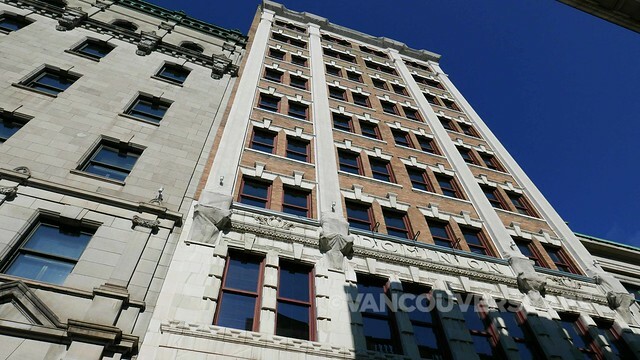 In 1912, the three men built a nine-story building on Saint-Pierre Street, at the time considered to be Quebec City’s first skyscraper. 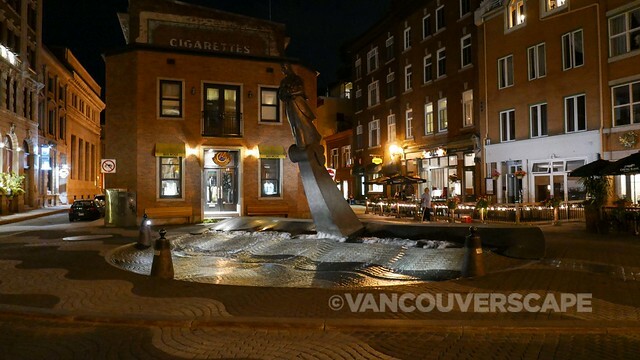 Since 1997, it’s been home to Le Germain Hotel Quebec. Five years later, the hotel chain took over the former Hochelaga Bank dating from 1902. 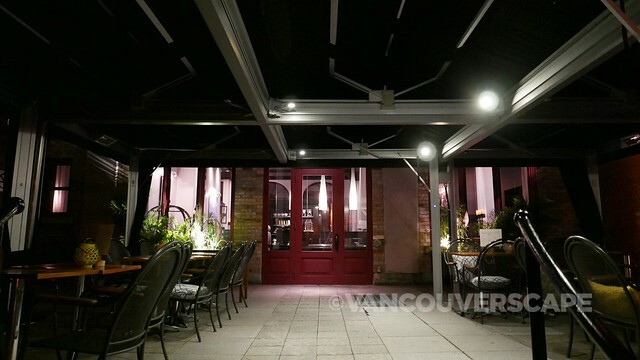 Le Germain has two entrances: the first with a stately glass door off rue Saint-Pierre, the other via a cozy patio as you enter from the parking lot. Doors from the old bank vaults were rearranged and placed on each floor to add to the hotel’s character. 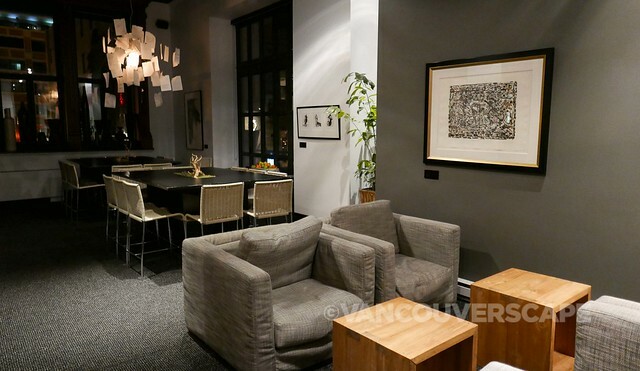 The vibe is modern meets Old Quebec as I notice the black exposed-beam ceiling, sleek black wall paneling and headboard that offers two steel tube lights above it. 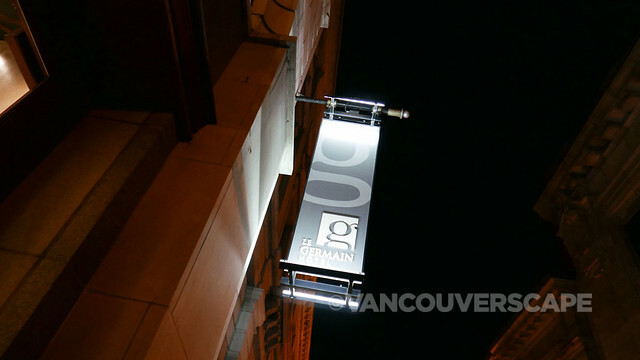 Each Le Germain hotel aims to integrate interior design into the neighbourhood they’re located in. Here I’m greeted with an enlarged black and white photo of the hotel building above the headboard and a series of images by local Quebec photographers on the bathroom wall. 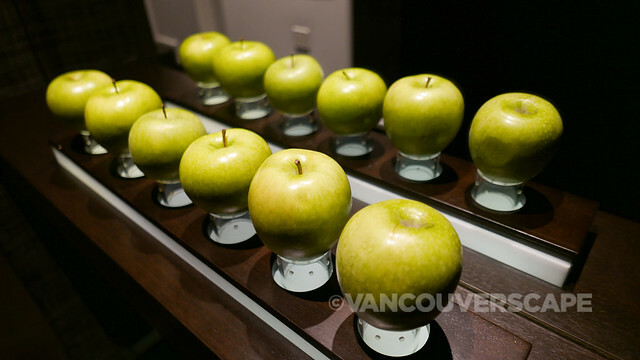 A feature that I’ve really grown to appreciate at Le Germain hotels is the combination of lighting in the rooms. Lights can be dimmed or brightened and fixtures moved to suit your needs. Next to my bed is a large Tolomeo floor lamp by Artemide, holding court above a cozy dark grey chair with white piping. 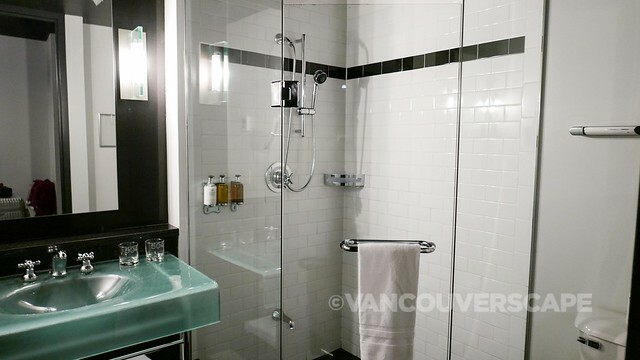 The bathrooms are also well-lit via several panels on the wall. 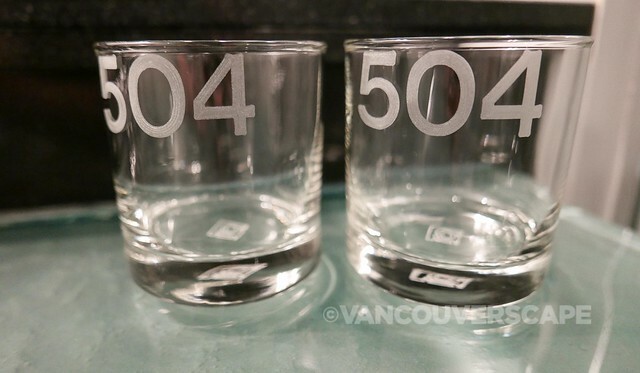 Drinking glasses are etched with your room number for an added touch of personality. 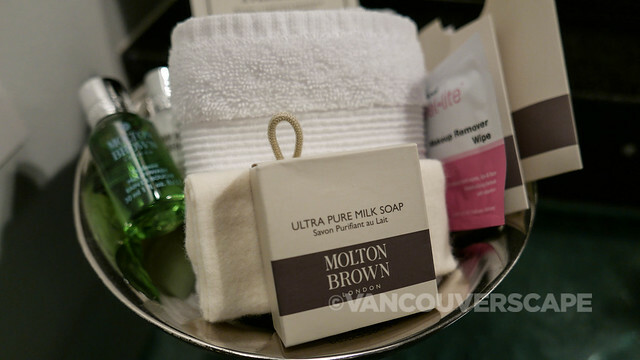 A magnifying vanity mirror, adjustable shower head and Molton Brown amenities complete the picture. 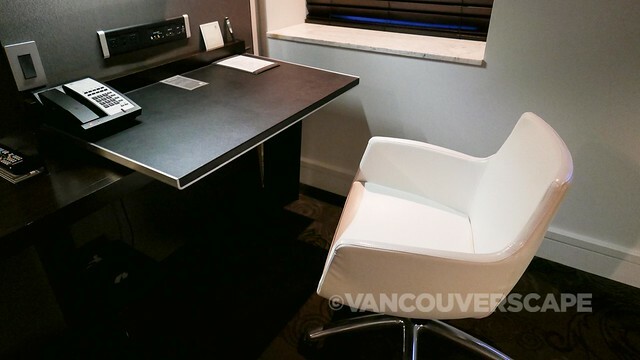 The desk contains a panel of audio and outlet plugs for easy accessibility and free wifi is included. 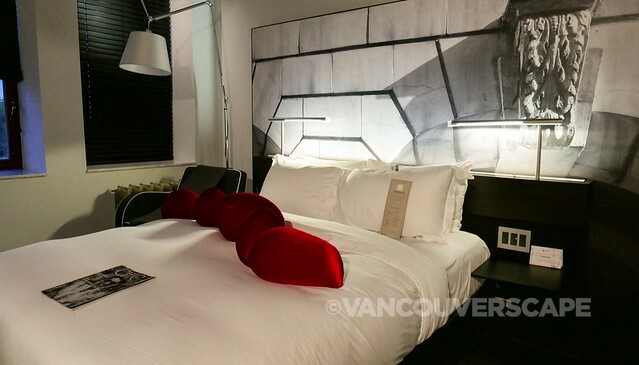 While the room I’m staying in isn’t as large as the one I stayed in at Le Germain Maple Leaf Square, I’m impressed by how well the space functions: there’s plenty of spots to stow the contents of your luggage without getting the feeling like you’re living on top of your stuff. Breakfast buffet’s offered in the lounge. Because Quebec City is easily enjoyed on foot, I’m sure you’ll have no problem justifying the croissants and pain au chocolat here. 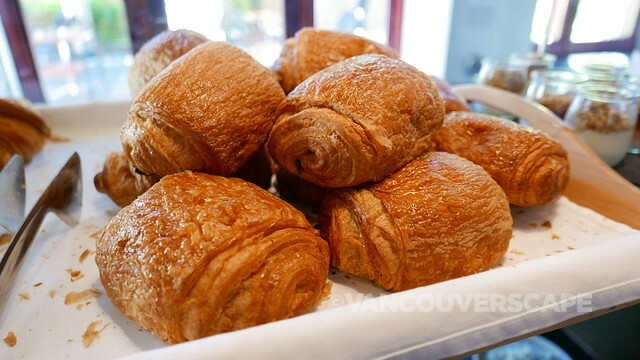 They’re made by Paillard, voted Quebec City’s best croissants since 2010, so one more reason to indulge. 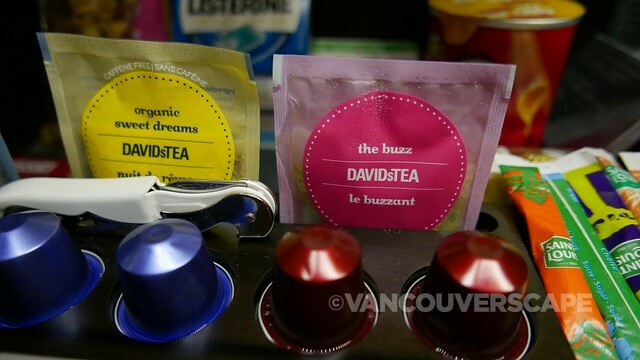 Coffee and an assortment of David’s Tea are available around the clock in the lobby. Rooms are equipped with Nespresso machines plus a selection of David’s Tea as well. 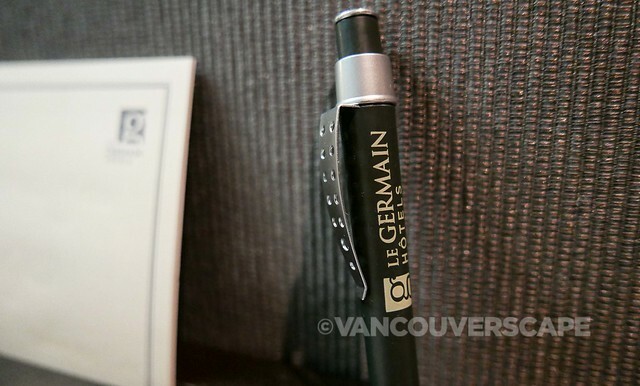 If it’s a luxury sleep you’ve come looking for, Le Germain is your spot. The hotel chain created a bedding collection that’s now being sold at Simons stores across Canada. The sheets, pillows and mattresses are some of the best in the industry: soft, cooling cotton and supportive mattresses and pillows. Even with jet lag knocking on my door, I slept soundly from my first night here. On the wall’s a super-handy do not disturb/please service room switch. 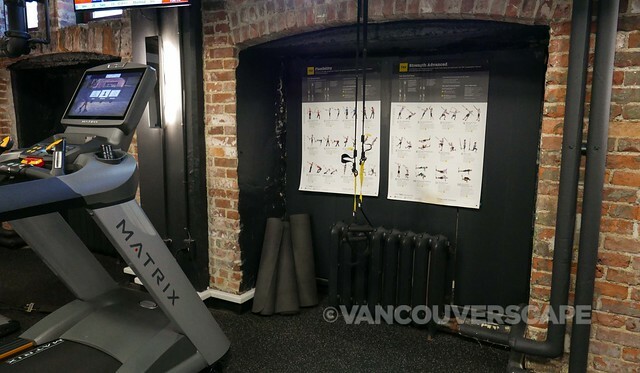 The basement level contains a gym with machines, free weights and a TRX training system. There’s fresh fruit, towels and water awaiting you post-workout and Lululemon yoga mats which can be used either in the gym or requested to be brought to your room for a good stretch in the morning. Service is friendly and helpful, particularly for getting you around the city. Staff know the neighbourhood well to give tips on dining, local attractions and points of interest. TIP: Le Germain’s based in the lower part of the city. A funicular at Du Petit Champlain will get you to the upper city close to the Fairmont Chateau Frontenac, Plains of Abraham, Observatory, Musée National des Beaux-Art du Quebec, shopping along St-Jean Street and other points of interest. Just a couple of doors down is Quebec’s fascinating Musée de la Civilisation. 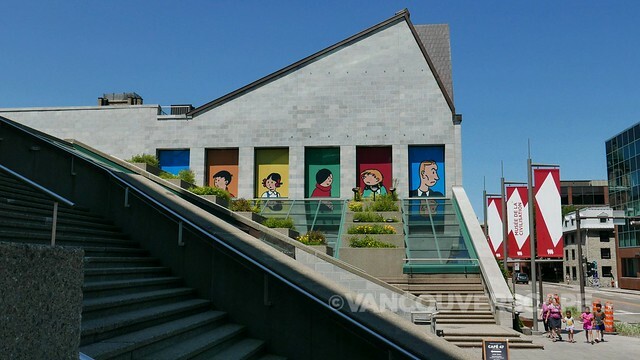 Until October 22, Tin Tin comic fans can get their dose of Hergé in a beautifully-curated exhibit of the man behind the colourful, adventurous Tin Tin and his faithful companion Snowy. 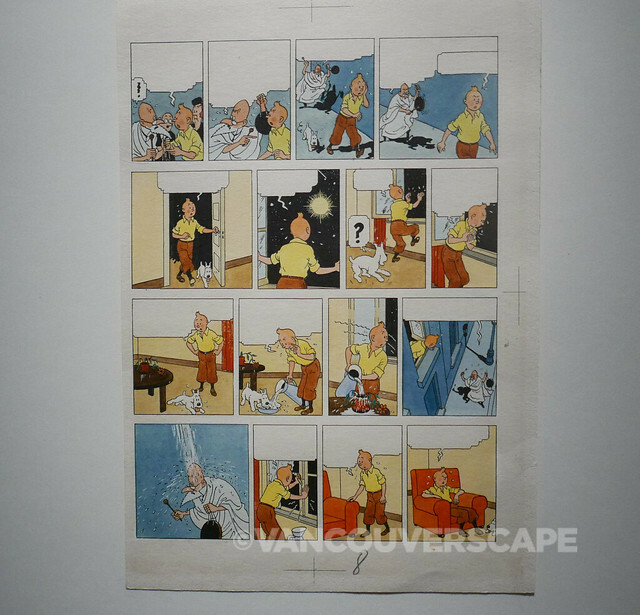 Since 1946, this well-loved comic strip has been recognized worldwide for its thoughtful approach to travel and discovery. Watching the silent films of Max Linder, Charlie Chaplin and Harry Langdon led Hergé to understand the need to make images instantly expressive and understandable. 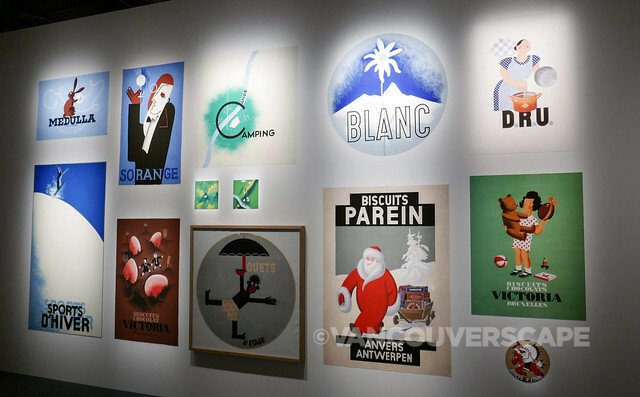 The exhibit features several rooms containing original sketches, printing plates and bold posters – an ode to George Remi’s ability to capture his boundless curiosity. 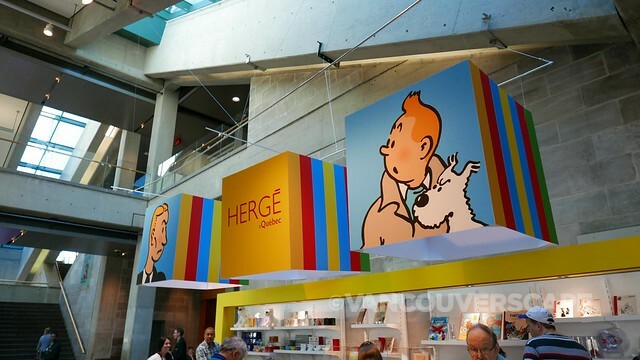 Tours of Hergé (as well as the museum’s permanent exhibits) are offered daily. You can even slip into some traditional period costumes in the onsite costume workshop. Chill out on a boat. 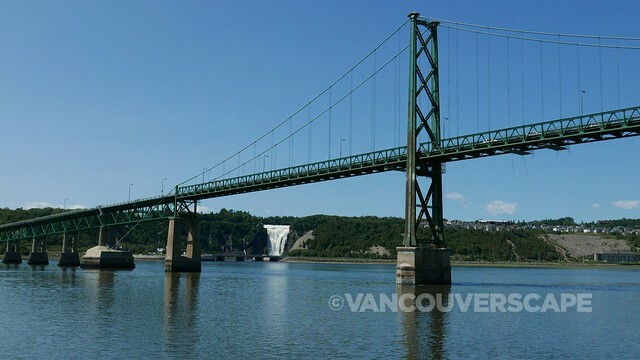 The Croisières AML will glide you along the St. Lawrence river up to Île d’Orléans, with a gorgeous view of Montmorency Falls during the 1.5-hour journey offered three times daily (11:30, 2 pm, 4 pm). Adult tickets are $34.95, kids 6-12 years of age, $19.95 (up to 5, free). A brief history of Quebec’s historical figures are also covered during the tour. 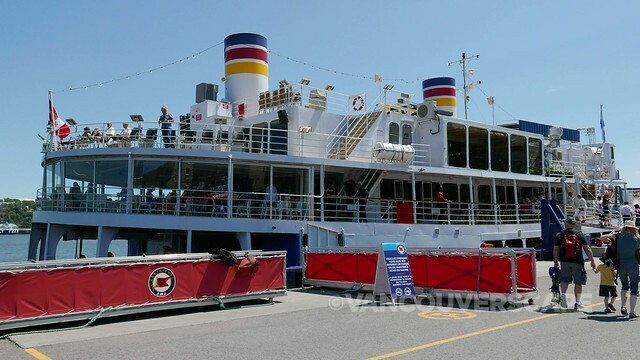 The M/V Jolliet can accommodate up to 1,000 passengers. There’s indoor and terrace bistro service as well. In addition to Quebec City, Croisières AML has cruising options in Montreal, Trois-Rivières, Baie-Ste-Catherine, Tadoussac, Berthier-sur-Mer and Rivière-du-Loup. Hotel Le Germain Quebec is located at 126, rue Saint-Pierre. My stay was compliments of Hotel Le Germain Quebec. Opinions, as always, are my own.